Because animals are increasingly subjected to contaminated water and feed many small and large farmers are following an age-old practice of mixing charcoal either into drinking water or the feed. This practice is widely followed in Europe with commercial activated charcoals specifically designed to be added to cattle and poultry feed. The activated charcoal supplement is able to adsorb many toxins from water-borne organisms or toxins from decomposing feeds. An added benefit is the marked reduction in waste odors. The bamboo charcoal powder may be fed to cattle as a feed additive, at a rate of 1 - 2% (by volume) (see Table 1). Alternatively, it may be added to the drinking water, as shown in Table 2. Used in this way, it will reduce the bad smell of manure by 50%. We would follow up Betty’s suggestion and recommend regularly sprinkling granulated charcoal either in the feed or where they tend to “scratch”. Mixing charcoal powder with drinking water in the above ratio makes a very easy and practical way of getting the poison-adsorbing benefits of right to the chickens. 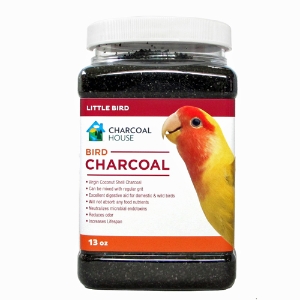 Granular charcoal is also an excellent avian digestive aid, especially for smaller birds such as parakeets and similar caged birds. It helps to fight hyperacidity and relieve stomach upset. We recommend that granular charcoal be placed in a treat cup or mixed with gravel. Charcoal not only cleans water of impurities, removes excess CO2, it also adsorbs some microorganisms and the toxins they produce that are lethal in artificial habitats. We would suggest sprinkling some charcoal granules in goldfish bowls and fish aquariums. To learn more how you can help care for your pets and livestock using the super natural benefits of charcoal, we recommend the book CharcoalRemedies.com The Complete Handbook of Medicinal Charcoal & Its Applications.